Wheelchair brakes hold a wheelchair stationery and keep the user safe. Do you know how to maintain and take care of your wheelchair brakes? Do you know when to replace them? This article will tell you everything you need to know about this vital equipment. There are a number of types of brakes that wheelchair users can install on their chair’s wheels. They are designed to hold a wheelchair in a safe stop. The brakes are usually called wheelchair wheel locks or wheelchair brakes. They can keep a wheelchair stationery when the user is engaged in a task or transferring to another piece of equipment. The most commonly used wheel lock on a manual wheelchair is the push / pull lock. A lever is pulled or pushed (hence the name) to make a bar press into the tyre of the chair, keeping it steady and stable. Different locks are available to suit people with different degrees of strength and co-ordination, so test out a few before making your purchase, to ensure you get one you can easily manage. Scissor locks are designed for more active wheelchair users, but could prove difficult for people with limited fine motor skills. While wheel hub locks have a concealed lever that locks the wheel via the wheel hub instead of the tyre. Extensions are also available for people who have less strength or limited reach, which can help a wheelchair user to operate their chair independently. Wheelchair brakes are not designed to slow a wheelchair down when it is moving, even though some people use them for this purpose. Users of manual wheelchairs slow their wheelchairs down by using pressure from their hands on the wheel rims, and users of electric wheelchairs use their controls to slow the chair down. A power assist wheelchair fills the gap between a manual chair with no brake assistance, and a powerchair with brakes. A power assist wheelchair looks similar to a manual one, but comes with clever technology installed, which automatically applies the brakes when the wheelchair user is going downhill. The light electronics detect the hand movement on the rims of a chair’s wheels, and slows or stops a chair according to what they sense. 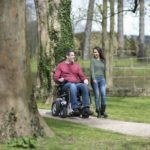 Electric wheelchairs also have braking systems that allow the user to slow down and stop without requiring physical effort or careful manual dexterity. 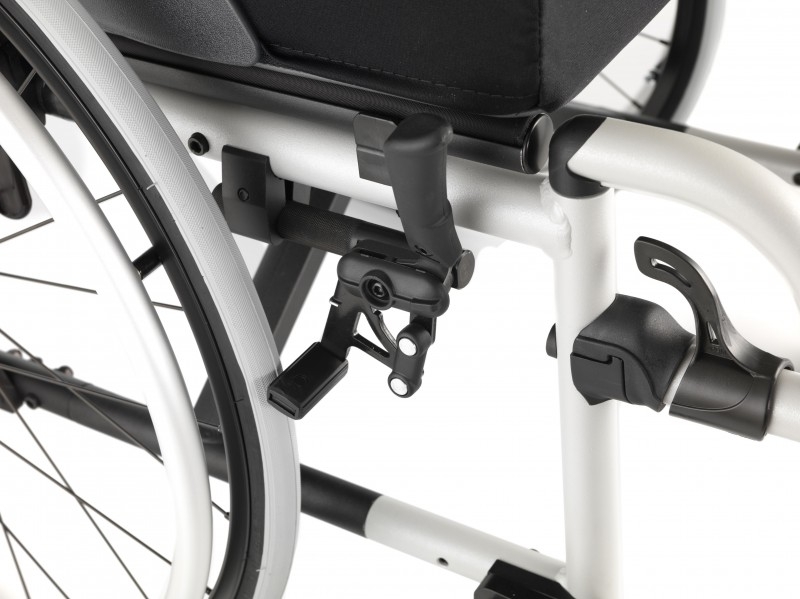 Usually operated by the user’s hand or head movements, brakes keep the user safe in a busy world and are a vital aspect of a modern wheelchair. 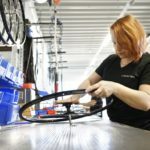 Carrying out ongoing care and maintenance of the brakes on your wheelchair is incredibly important, so that they last a long time and do not cause any safety or usability issues. Whether the brakes are looser or tighter than usual. Are they too loose or tight to operate effectively and easily? Whether the brakes are effectively stopping the chair from moving. Whether the brakes are easy to lock and unlock. Always double check your chair’s manual when you want to check how effectively your brakes and wheel locks are working. 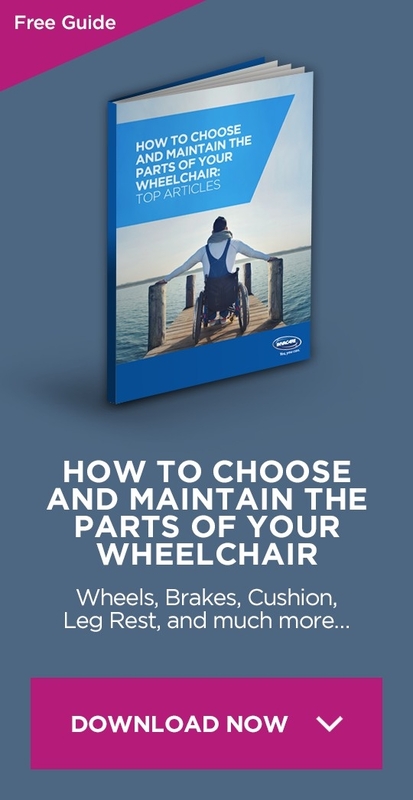 If they then need to be tightened or loosened, especially when you first get the wheelchair, the instructions are likely to be within the manual. Often, it is possible for the user of the chair or their assistant to do this themselves. 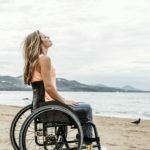 If you need adjustments that you are unable to carry out yourself, take your wheelchair to a repair shop, or even to a bicycle repair store, to get the brakes adjusted professionally.